Taylor Ruck is an 18 year old swimmer who specializes in freestyle and backstroke. She grew up in Arizona, training with Scottsdale Aquatic Club, but she was born in British Columbia and has competed for Team Canada since 2015. Some of the international meets she has attended include FINA World Junior Championships and the Rio Olympics. At the recently concluded Commonwealth Games, her 8 medal win had her tying for the all-time Commonwealth record for medal count in a single Games . Taylor Ruck first represented Canada at the 2015 FINA World Junior Championships, before going on to win her first 2 Olympic medals as part of Canada's relay teams and dominating the Commonwealth Games. 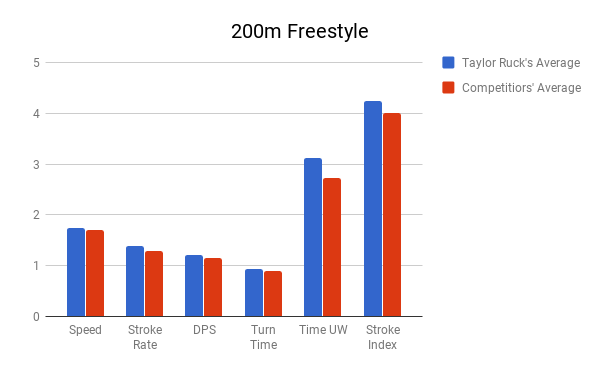 We analyzed Taylor's metrics in the 200m freestyle and 100m backstroke at the Commonwealth Games to see what we can learn from her performance. Despite being different strokes and distances, we see similar trends occurring in both events. Taylor had a slower than average stroke rate, but pulled with a higher DPS. This combination was enough for her to generate a faster speed in both cases. Her high DPS and speed contributed to her high stroke index, which translates into better efficiency. Taylor swims around 5.99% more efficiently than her competitors in the 200 free and is around 6.81% more efficient in the 100 back. On average, she was turning at a slower time than her competitors, though the difference is larger in the 200 free. 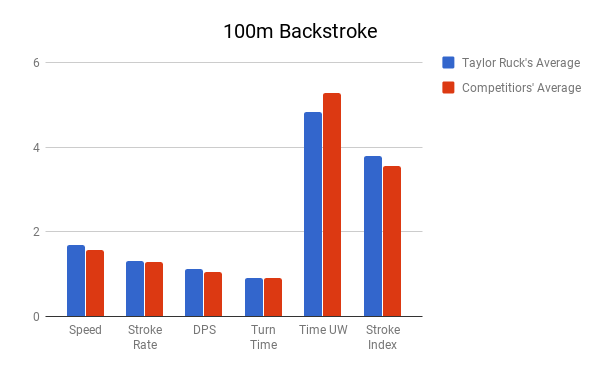 While slower turns can break a race, Taylor was able to maintain her lead through the power and efficiency of her strokes. Her time underwater varies between the 2 events, spending around 0.4 seconds longer than average on her underwater in the 200 free, and breaking out around 0.46 seconds earlier than average in the 100 back. Sprints aren't necessarily won by taking faster strokes. Slower, but more efficient strokes do have the potential to generate great speed, while leaving enough energy to finish strong. Focusing on powering through, instead of rushing each stroke, can be extremely effective in winning races for some athletes.